What kind of material do you like best for picks? Discussion in 'Effects, Pedals, Strings & Things' started by Paul Anderberg, Jan 23, 2012. This seems straight forward enough. What do you like best for your main pick? The material that Blue Chip Picks uses! lol, nice! so, which out of those is your #1? And how'd you get that case? I want one! My local shop, which, surprisingly, carries V-Picks, has a display case like that for their V-Picks. 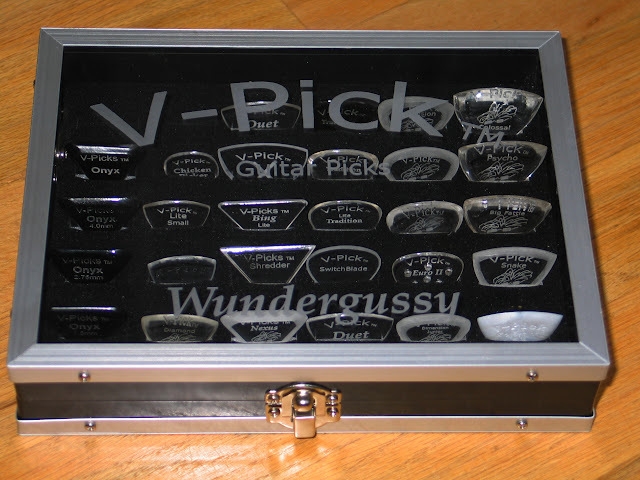 My guess is that a big buyer/collector of V-Picks, such as wundergussy, either bought or, perhaps, was even given, as a bulk buyer, that case from Vinnie. Oh, and my #1 is the Diamond, #2 is the Small Pointed, and #3 is the unbuffed Bb. Whatever the Jazz II & III are made of! These should not be in the same category, not even remotely the same material. My #1 is a thick Rosewood, unpolished. Warm and woody tones. Thing is, I've tried other rosewood picks because I need a replacement (wood picks aren't the longest lasting), but I have not been able to get the same tone as my number 1 because they were either too thin or too smooth (very buffed). I've been trying all kinds of picks trying to replicate my #1 but no success. Need to find a thick (3 or 4mm) unbuffed rosewood but haven't been able to. never tried acrylic let alone real tortiseshell. i tried one of the thin brown v picks and although it was comfortable, it wore out fast. are the clear ones better? But I like my Red Bear Lil Jazzer as well, and sometimes will use a simple Jazz III. Whatever they make those vintage pickboy tortoise shell pix of... Man they sound good. Oh don't be so hard on yourself. Personally, I can respect people who are so passionate about something that they go "whole hog".